There’s so many gift ideas for the makeup, skincare, and wellness gurus in your life that it can be a bit overwhelming, especially when this is suppose to be the most wonderful time of the year. But, have no fear! 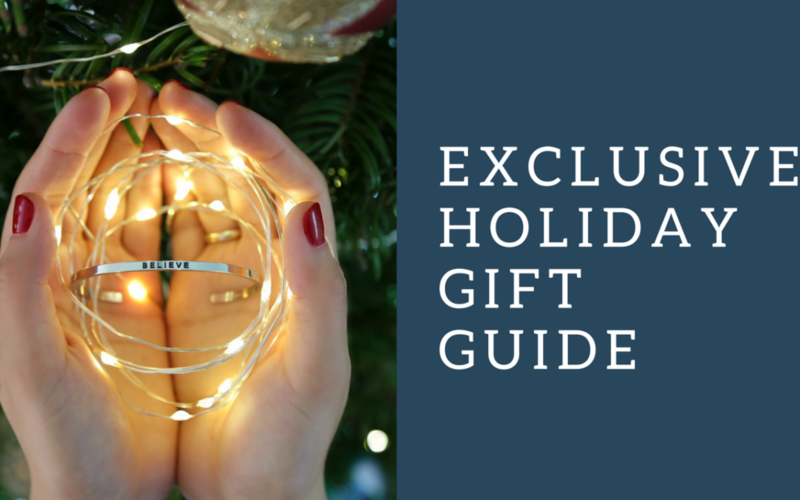 Our Exclusive Gift Card Guide makes AgeLess SPA your one-stop shop for everyone on your list to bring comfort and joy into their lives this holiday season. This year’s bareMinerals’ Holiday Kits are our most favorite holiday collection bareMinerals has released thus far. From the beautiful packaging to being reasonably priced, starting at $12, these amazing kits make great stocking suffers for those makeup lovers. But don’t wait too long to purchase your kits because they’re only available during the holiday season! We know there’s a lot of options when it comes to Image Skincare, but there are three Image Skincare products that are always our go-to. First, we can’t live without the Vital C Hydrating Facial Cleanser, not only for it’s citrusy smell, but it can be used all year long. Second, the AgeLess Overnight Retinol Masque works wonders! It’s perfect for the busy person in your life because they just have to put it on before bed and wash it off in the morning. Last but not least, we love the Ormedic Lip Balancing Lip Enhancement Complex. This lip enhancement keeps lips hydrated, especially during those harsh winter months. MantraBand is gaining popularity and with good reason. This brand embraces positivity, mindfulness, and optimism, while bringing a daily dose of inspiration into one’s life with a mantra. There are dozens of mantras to choose from, such as, “You are my sunshine”, “Hakuna Matata”, and more on bracelets and necklaces, available in silver, gold and even rose gold! If the person you’re buying for always has sore muscles or back, we highly suggest Herbal Concepts wraps. These herbal wraps can be microwaved or even placed in your freezer. And with a variety of styles to choose from, depending on the person’s neck or back pain, you can’t go wrong giving this to the person who needs a little muscle soothing in their life. So many of us suffer from unwanted hair, and at AgeLess SPA in Horseheads, NY, but we can help! Our Laser Hair Removal Packages are designed to help provide the results you’re looking with special package pricing. By giving a Hair Removal Package, it takes the worry out of shaving and saves the person so much time getting ready! From Laser Hair Removal Packages to Waxing Packages, we offer a wide variety to give the gift of saving time in the mornings. Our Mini Spa Treatment includes a 30 minute Integrated Massage followed by a 30 Minute Signature Facial, which is perfect for the busy person in your life that needs an hour of spa time. Please note: This treatment is known as The Small Blind at our AgeLess SPA at Tioga Downs Casino & Resort location. Prices vary by location. If you want to “WOW” them with the ultimate gift, we suggest giving them our Full Spa Treatment in our Corning, NY location. This package starts with a One Hour Integrated Massage, followed by a One Hour Signature Facial. After these two services, a lunch is provided in our Serenity Room to enjoy until the last two services of the day, which is a Basic Manicure and Pedicure Polish Change. Please note: this treatment is only offered at AgeLess SPA at Radisson Hotel Corning. However a similar treatment is also offered at AgeLess SPA at Tioga Downs Casino & Resort and is known as The Big Blind, but does not include lunch. Prices vary by location. With so many options to choose from, we understand that it can be overwhelming to pick for another person. In that case, the AgeLess SPA Gift Card is the perfect gift! Allowing your loved one to choose the service they’re in most need of, and enjoying some much needed “me time”. Whichever gift you decide to give, we hope that it brings your loved one comfort and joy! From our family to yours, we wish you a very happy holiday season and new year! We’re here to save the day with our AgeLess SPA On-The-Go services for those busy bees always on-the-go, wishing they could go to the spa and have that much needed “me time”! Spa services aren’t luxuries in our eyes, they’re necessities. It’s something we make time for no matter how busy our schedules are and for good reason; it’s a form of self-care. For example, we go to the grocery store regularly for nutrient rich food to take care of the inside of your body, so why not go to the spa to take care of the outside of your body? If we aren’t taking care of our body entirely, does this mean we’re just getting by in life and aren’t focusing on our overall health? We often forget how good our bodies are meant to feel because we’re so busy working, taking care of others, and putting ourselves on the backburner. But whether it’s on your lunch break or while the kids are at extracurricular activities, there are options here to fit in your busy schedule. So what is considered an AgeLess SPA On-The-Go service? Just about anything that takes less than an hour and the best part is most of our services do just that! Even though our 60 Minute massage is our most popular (because a 30 Minute Integrated Massage just doesn’t feel long enough when it feels so good to lay on a bed warmer and have one of our lovely massage therapists loosen up those sore muscles), sometimes, time does not allow for that to happen. If you are looking for a quick service where you want to have your shoulders loosened up from typing all day or help with lower back pain from sitting and/or standing for hours at a time, a 30 Minute Integrated Massage can help you with that. It can also be a quick full body massage to give you just a half hour to loosen up. The best part is this can easily be done on a lunch break or even after work. If you have somewhere to be after and don’t want your hair to be too messy or walk out with the glowing “massage face”, plan ahead of time and pack some dry shampoo and makeup to touch up. But if you still don’t have time to pack those essentials the night before or the morning of, just kindly communicate to your therapist that you don’t want your head and face touched due to a commitment post-massage. But, we promise, there’s nothing wrong with the post-massage glow. Another favorite is our Mini Signature Facial. This facial is just like our Signature Facial but in half the time. It only takes half an hour, which cleanses, exfoliates, and brings your skin back to life in a blink! This facial also gives your esthetician time to recommend the perfect products to incorporate into your daily regimen to fit your on-the-go needs. For people on-the-go, the last thing you want to think about is dealing with the unwanted hair you don’t want showing on your body. We love that our Laser Hair Removal services can be so quick and easy. Even our dear friend, Alisa, from Sense of Shine, is able to fit it in her busy schedule. From legs, underarms, bikini areas, to even the face, you can get these services done on your lunch break or while the kids are at their extracurricular activities. Have your cake and eat it, too with our Mini Spa Treatment! We made it easy for you to have a spa day in just one hour by combining our 30 Minute Integrated Massage and 30 Minute Mini Signature Facial; it’ll be like having your cake and eating it, too! First, you’ll get to have your sore muscles worked on. After, you’ll be able to relax during a quick facial to free your skin of any dirt and grime that gets picked up from your daily routine. As mentioned above, our 60 Minute Integrated Massage is the go-to massage when time allows, simply because it’s nice having that full hour for our massage therapists to really give attention to every area needed. It also allows more time to warm up your muscles with warm towels and work on your body where you deal with chronic pain, muscle fatigue, or any problematic area. Our most loved facial will leave you glowing! Our most loved facial is our Signature Facial and with good reason. This facial offers a professional skin analysis, steaming, exfoliating, deep pore cleansing, extractions of toxins, toning, mask, and massage. Plus, can we mention how amazing it is to have the warm booties put on as you relax on a bed warmer? Yes, please! Treat yourself to a manicure without worry about drying time! We believe treating yourself to a good manicure is a form of wellness, simply because it makes us happy and there’s nothing wrong with doing things that make us happy. But in all honesty, who has time to deal with nails drying these days? Especially when gel nail polish exists. With an AgeLess Hand Detail with Gel Polish, your hands will always look taken care of within an hour and you rarely have to worry about chipping since it typically [but not guaranteed] lasts up to two weeks once they need to be freshened up again. This service is SO perfect for the person who does not want to worry about their nails at all except for when they need to come in for an hour to get them done with one of our licensed professional nail technicians. Similar to acrylics, gel enhancements are healthier and more durable, if done the right way by a professional. It looks more natural because it helps to protect your nail from breaking and you can keep it at any desired length. You rarely have to worry about the enhancements breaking or chipping, which is so nice with busy schedules. Some ladies come in every two weeks for a fill but others can make theirs last for up to a month! We offer a variety of skin care products for you to use at home when you really don’t have time to come to the SPA. If you want something you can put on and not have to wait for it to dry or soak into your skin, we suggest going with the AgeLess Total Overnight Retinol Masque by Image Skincare. All you have to do is put it on at night, go to sleep, and wash it off in the morning. It’s so easy and leaves your skin feeling so soft. But if you have a little time before bed, we suggest using the Image Skincare Biomolecular Anti-Aging Radiance Mask or the Image Skincare Biomolecular Hydrating Mask. Both of these masks are formulated, unlike any other masks, you would find at Target or Ulta. You just have to leave it on for about 20-25 minutes or until it is absorbed into your skin, and then remove and discard the mask. It will give your skin that hydration and AgeLess look you’re going for. From massages helping relieve your muscles from sitting at a computer or standing all day, to treating yourself to a simple, durable manicure that makes you happy, it’s important to take care of yourself in every way possible. That’s why we designed our services to be perfect for the person on-the-go because your wellness matters, too. So go ahead, look ahead in your planner and schedule at least a half hour to an hour to take care of yourself with our on-the-go services. And with our memberships, you’ll be saving money on your services and even enjoy a complimentary service each month, depending on what membership you choose – bonus! AgeLess SPA On-The-Go, it’s the SPA you go to while on-the-go. The first time you heard the phrase “hot stone massage” did you visualize some medieval dungeon where you would be subjected to red-hot rocks covering your body? If uncertainty has kept you from indulging in this style of Massage, you’ve been missing out on one of most relaxing, invigorating spa experiences available. As with any of our massages, our Licensed Massage Therapist will consult with you first to determine any concerns you have. Because Hot Stone Massage focuses on specific areas of the body — acupressure points — your therapist will want to know if you’ve been experiencing pain or discomfort in any particular areas prior to your visit. This will ensure your Hot Stone Massage experience is customized to meet your unique needs. Our Licensed Massage Therapists are and trained in the art of giving a hot stone massage and make no mistake about it, it’s an art. They understand the human body and will place the stones in the ideal areas to reach your acupressure points and offer you maximum relief. If you’ve ever used a hot water bottle or a heating pad on a sore muscle, you know the relief it can bring. Now imagine having one of our Therapists use hot stones to massage your aching body, the smooth stones offering deep, penetrating heat as they unlock your tight muscles. While the stones are initially placed on your pressure points, the therapist will also use select stones to massage your body, transferring the heat from the stones to you, with results that will melt away your stress and pain. Strategically placed hot stones open the blood vessels in your body, increasing the flow of blood through your system. This improved circulation can relieve pain, but also increase your energy, promote healthier skin, and better equip your body to fight illness. Proper blood flow in your body is critical to your overall health and a hot stone massage can greatly improve your circulation. Still Have Questions About Hot Stone Massage? Still have questions? As with all of our spa treatments, our staff is available to answer your questions and assist you in making the best choice for your next visit. If you live closer to our Corning, NY location – we offer the same massage modalities but here is a link to that page on our AgeLess SPA at Radisson Hotel massage page – this link will open in a new tab for your convenience. The positive benefits of massage are countless. Getting a regular, or even an occasional massage, can provide many benefits both physical AND mental. From the more obvious benefits of massage such as the relaxation you feel almost immediately after hopping onto the table, to the more subtle, yet equally important, long term benefits your body receives and absorbs over time. The list of the benefits of massage is long and continues to grow. Picture the following scenario: You stumble out of the office. Ok, not literally ‘stumble’…but close to it. You knew that today was going to be a tough one, but nothing could have have prepared you for the day you’ve just faced. You’re old enough and wise enough to have many tools in your arsenal that can help you to relax and unwind after a day such as this, so you begin your mental checklist. Perhaps a workout at the gym is in order to “work out” your frustrations; maybe meeting some friends for drinks at Happy Hour would be the thing to do; you could also simply take a nap. All these ideas are well and good, but today you’re truly in the mood to do something a little bit nicer for yourself. That’s when you remember the gift certificate you received for Christmas from your best friend good for a 90 minute massage! That thing has been sitting in the “junk” drawer for 3 months now. It’s not that you didn’t appreciate the gift, you just haven’t set aside the time yet to make the call and book the appointment. Today looks like the day to break the pattern. Two hours later you find yourself face down on the table in a dimly lit room. Relaxing music soothes you while your therapist slowly works the knots out of your muscles and makes your entire body relax from the soles of your feet from the crown of your head. Your mind is completely focused on the bliss your body is feeling and you can barely even remember the stress that caused you to book the appointment in the first place! Why on earth did you wait so long? While basic human touch encompasses far more than massage, massage obviously falls into the category of human touch. In a world that increasingly makes it easier and easier to rely on technology to “communicate” with one another, many experts in human psychology fear that we’re slowly losing the human connection factor of touch. And why wouldn’t they? We send more emails than we extend handshakes, more smiley emojis than hugs, more facebook “likes” than pats on the back. The actual benefits of non-sexual human intimate contact are extensive and go far beyond the scope of this short blog post, but in the spirit of giving you a brief overview, here are just a few things to consider. Non-sexual human touch has been proven to make us better learners. Human touch can help us be better members of dynamic teams (ie; sports). It is shown to boost the immune system, foster cooperation and trust and decrease violence. Human touch has even been shown to lower blood pressure and cortisol levels. There is little doubt that the (officially acknowledged) lists of the benefits of massage continue to grow. It isn’t necessary, however, to limit ourselves to only getting a massage to help treat or alleviate a symptom on a list. If you think a massage could be helpful with some other issue you have why not give it a try? Of course, if you question a particular condition, consult your doctor first. Yes the benefits of massage therapy are huge. Some are well documented and “proven”, some may just be speculation at this point. Either way there is no need to keep our minds “in the box” when considering how massage therapy can be beneficial to us. Heck…get a massage for the simple reason that you WANT to. You deserve it. At AgeLess, we offer lots of choices when it comes time to make a decision regarding what type of massage you’d like to try out next. *For a complete list, follow this link (link will open a new browser tab). *Our massage offerings are the same at both locations. If you’d like to visit the website for our Radisson Hotel location in Corning, follow this link – to the Massage Page for that location.